A Maine camping guide can be useful if you plan on taking a trip to this northeastern state. Maine has numerous campgrounds and beautiful surroundings, including a national park. It's best to know a little bit about the area before heading there, especially since the weather can be quite harsh at times. Maine is the largest of the New England states at 33,215 square miles. It has approximately 228 miles of general coastline and over 50 mountains, including Mount Kathadin, which sits at northernmost point of the Appalachian Trail. The state is also inhabited by numerous lakes and ponds. The largest lake is Moosehead at a total of 74,890 acres. Tourists tend to visit Maine in the summer. Its most popular cities, Portland, Kennebunkport, Bar Harbor and Jonesport, are very crowded during these times. Likewise, the campgrounds near these cities tend to be crowded. This is because the temperatures usually stay between 70 degrees and 90 degrees with fairly low humidity. If you want an entire campground to yourself, head up to Maine during the winter. Temperatures often drop to below 20 degrees overnight and the entire state gets blanketed in snow on a regular basis. The northern piece that borders Canada tends to be colder than the coast and southern half, but it is not balmy by any means. This leaves spring and fall as the best times to go if you are not interesting in extreme cold weather camping. Note that the spring tends to be a bit muddy, thanks to snow melt from the winter. The fall offers tempting views thanks to the changing leaves in the ample forests. 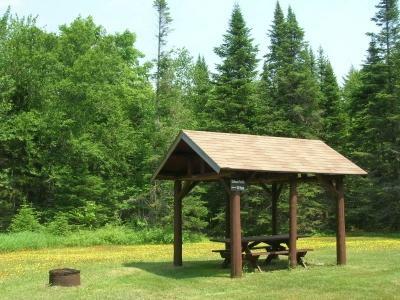 Sebago Lake Campground - This campground, on the shore of a large lake near Portland, is a good spot for people who like the recreation aspect of camping more than the idea of being surrounded by wilderness. You can walk to a sand beach that features picnic tables, grills, bathhouses, boat ramps and nature guides. You can also hike on paved trails. Lake Umbagog - Technically jst over the state line in New Hampshire, this camping area is on the western side of the state directly between Maine and New Hampshire, and it has 30 remote state-run sites interspersed on its coastline. These sites have only a picnic table, a pit toilet and a fire area. You have to bring in water and ice from the main campground. You're likely to see area wildlife, such as bald eagles and moose, and the lake makes for excellent fishing. Develped sites and RV hookups are available as well. Baxter State Park - This park offers a happy medium, with 10 different campgrounds, ranging from remote hike-in sites to family friendly drive in areas. None of these campgrounds are fancy by any means; they do not have showers or flush toilets. However, most have rental cabins available and water and supplies near the sites. Baxter is located in the mountainous region, so take extra care if camping here in the winter. It's also a good idea to bring cross country skis or snowshoes. That way you can get around easily even during blizzard conditions. It's especially important to inform friends and family of where you will be before you leave and to use common sense when hiking or climbing in dangerous weather.